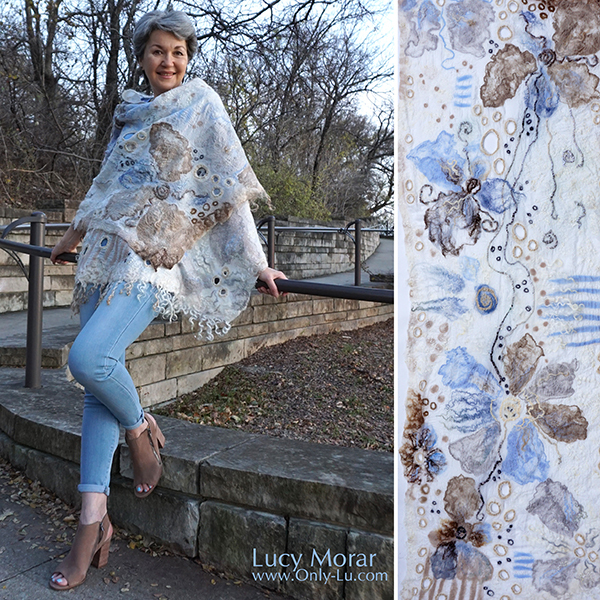 This entry was posted in nuno felting, scarf on December 2, 2018 by Lucy Morar. Natural flow of images with flowers of different shades and shapes, sometimes even light contours. Full of harmony and love. 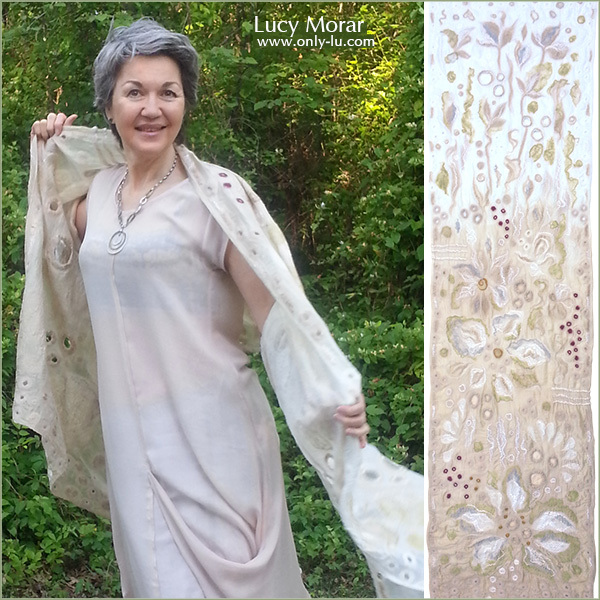 Made of natural chiffon silk, and fine merino wool in technique of nuno-felting. This entry was posted in nuno felting, scarf on November 19, 2018 by Lucy Morar. Festive and expressive design rich with peony flowers, large and small, dancing to quiet music. Hand-made of natural chiffon silk, fine merino wool in technique of nuno-felting. This entry was posted in nuno felting, scarf on October 29, 2018 by Lucy Morar. Created to be a personal gift to someone who helps and inspires people. Very charming and full of light. Made with love of fine merino wool and natural chiffon silk in technique of nuno-felting. This entry was posted in nuno felting, scarf on September 16, 2018 by Lucy Morar. 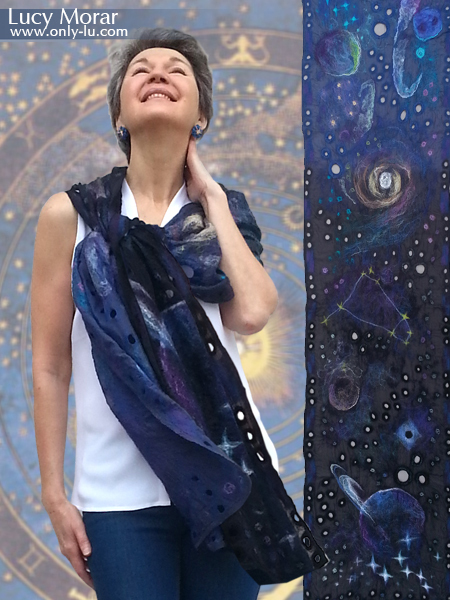 Inspired by the eternal source of wonders and beauty, home of unthinkable number of worlds, design of this scarf is abundant with stars and celestial bodies. Handmade of fine natural merino wool and natural chiffon silk in technique of nuno felting. 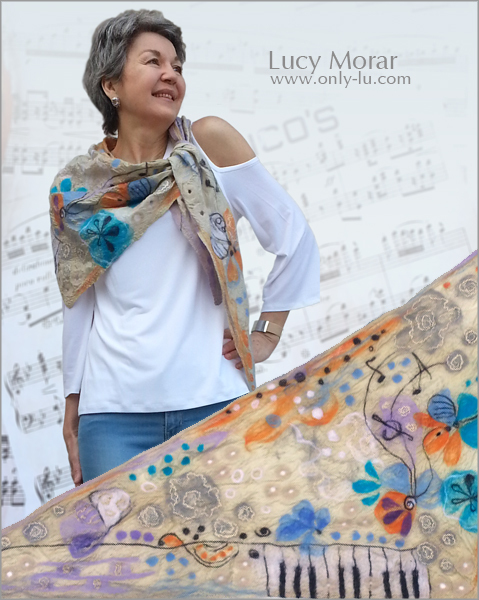 This entry was posted in nuno felting, scarf on July 18, 2018 by Lucy Morar. A warm gift to a friend. 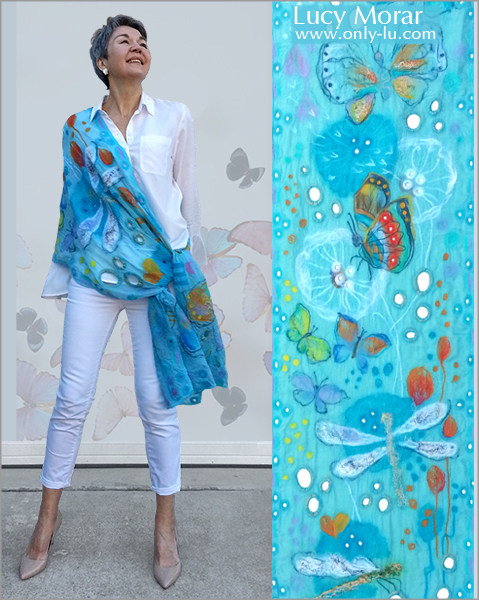 Triangular scarf with abstract floral design, soft colors and free flowing streams of inspiring music. Made with love of natural chiffon silk and fine merino wool in technique of nuno-felting. 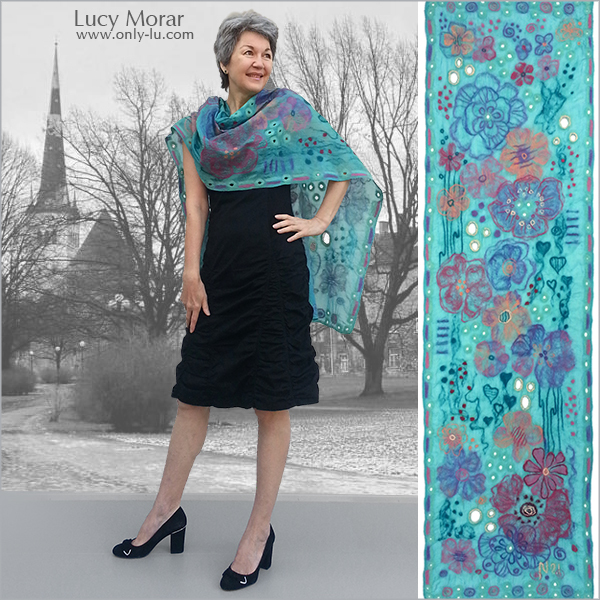 This entry was posted in nuno felting, scarf on June 7, 2018 by Lucy Morar. Very magical and full of light and air, with flowers, butterflies and dragonflies moving in a slow dance. Celestial blue chiffon silk, fine merino wool. Handmade in technique of nuno-felting. This entry was posted in nuno felting, scarf on January 15, 2018 by Lucy Morar. Charming motive in muted tones with floral abstraction on white silk. Full of gentle light and calm comfort. 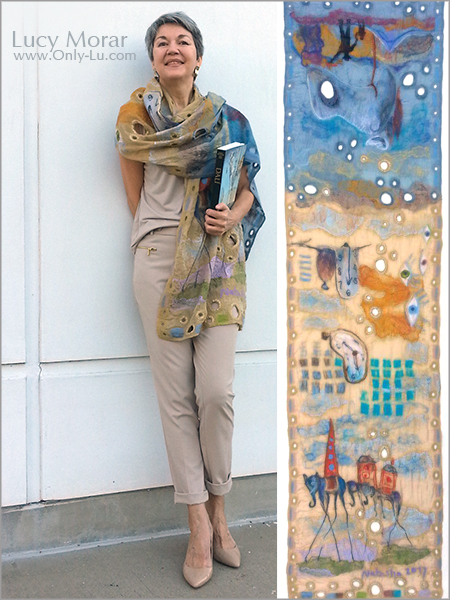 Handmade with love of high quality natural chiffon silk and merino wool and fleece in technique of nuno-felting. This entry was posted in nuno felting, scarf on December 19, 2017 by Lucy Morar. This entry was posted in nuno felting, scarf on October 19, 2017 by Lucy Morar.